Omid Memarian is well known for his news analysis, regular columns and blogs in English and Persian. Memarian works as a freelance writer for the IPS News Agency (Inter Press Service) Rooz Online and regularly blogs for the Huffington Post. He has had op-ed pieces published in The New York Times San Francisco Chronicle, Los Angeles Times, Opendemocracy.org and Contra Costa Times. He received Human Rights Watch’s highest honor in 2005 the Human Rights Defender Award for his courageous work as a human rights activist. 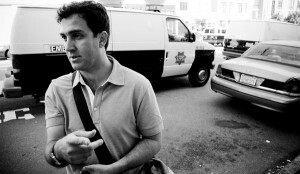 Omid Memarian was a visiting scholar at UC Berkeley Graduate School of Journalism from 2005-2006 and is currently a Rotary Peace Fellow at the Journalism School. He was awarded the Golden Pen Award at the National Press Festival in Iran at 2002. He has been blogging since 2002, in English and Persian. Omid received his bachelor’s degree in Metallurgy engineering from the Azad University in 2001, Iran. He was the editor in chief of Volunteer Actors Quarterly which dealt with civil society issues from 2003-2005.